After tapping a specified target (usually an touch target showing the time) a time picker dialog appears on top of the current screen, containing at least the time or date that will be set, controls to set the time, and two buttons for confirming and canceling the action. In addition, an am/pm button can be provided to easily switch between am and pm times, i.e. when the clock is set this way. With the plus and minus controls, the user can set the desired time. Every tap on the control makes the value move up or down one step. By holding the control, the values moves up or down faster. The value at the top of the box changes according to the value the user sets using the controls. The user taps the ‘ok’ button to confirm and set the time. The Plus minus date and time picker is useful in every situation when the user has to set the time or date. In addition to this way of giving in time or date, you should have the keyboard working. You can also choose to use the wheel for picking date or time, but this one is the less standard date and time picking tool in all Android devices. Easy to understand how it works, because it has a lot in common with setting digital clocks, to which users are familiar with. 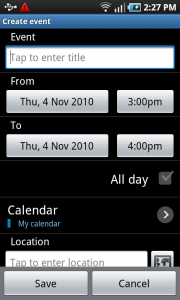 1 To create a new event in the calender, the user can pick a date and/or time by tapping a button. 2 Setting a date shows controls for the values day, month and year. 3 Setting a time shows controls for hour and minute. The clock is set here to am/pm, so an extra button is provided for switching between the two. 2 ... opens the dialog for time input. Though this maybe true, but if the dialog is implemented correctly, the title of the AlertDialog should change according to the current value which the user adjusts. 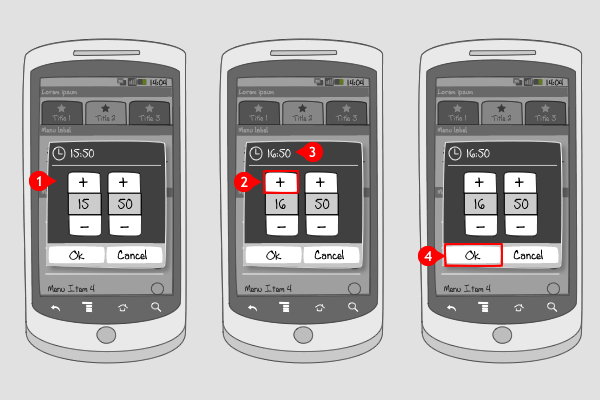 So the user can still see the value when using the upper buttons. Other ways to set time and date?